On this page, you’ll learn about this procedure, as well as what you can expect from Dr. Lutfi and his staff. We have performed numerous successful revision surgeries using the most advanced techniques in the field. Dr. Lutfi has many years of experience working with patients who wish to lose weight and get rid of diseases such as high blood pressure and diabetes. To date, he has performed more than 2,500 weight loss procedures. We focus on wellness and treat the whole patient – body and soul – with a dietitian, psychologist, experienced nurses, and an insurance specialist on our full-time staff. Our relationship with you is paramount. Whether your original surgery was performed by someone else or by Dr. Lutfi, you will meet with him personally right away on your first visit. He will then be available to you from the time leading up to your surgery to the entirety of your recovery. While we practice “Evidence-Based Medicine” that follows the latest scientific evidence at our Institute, we believe that the choice of surgery and the plan of care should be customized for each individual based on their history, expectations, and goals. While we practice “Evidence-Based Medicine” that follows the latest scientific evidence, we believe in our Institute that the choice of surgery and the plan of care should be customized for each individual based on their history, expectations and goals. What Makes Revision Bariatric Surgery Necessary? Sometimes, the first bariatric surgery does not achieve the desired results for a variety of reasons. If there is no post-operative weight loss, it’s easy to tell that the initial surgery was unsuccessful. This is true if the gastric pouch that was created was too large. If that is the case, the patient may lose very little weight or begin to regain weight after about a year when small meals cease to be satisfying. Sometimes, however, patients regain weight even years after a successful bariatric surgery. This can happen even if they work hard, exercise, and adhere to a relatively strict diet. We do not judge those who need a second surgery! It can happen to anyone. For example, if the connection between the small intestine and the stomach pouch dilates, the stomach pouch will empty more quickly, and the patient will no longer feel full. The pouch can also stretch in size so that it holds more food, causing weight gain. Nevertheless, do not feel discouraged, as many patients experience success from a single surgery. It is just like any other illness or condition – some of us need more treatment than others. So if you need a revision procedure, do not feel like you have failed. It’s very important to Dr. Lutfi to provide caring, non-judgmental treatment to all of his patients. 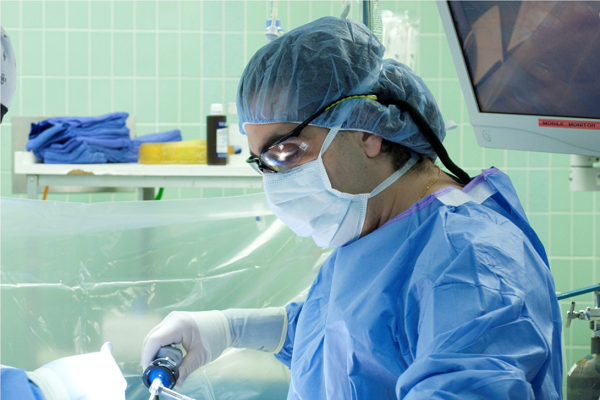 Revision Bariatric Surgery can be done after most any bariatric surgery technique depending upon the patient’s condition. Dr. Lutfi will examine you and discuss what technique he recommends for your revision procedure. He will discuss your goals and options with you in detail to make sure you feel comfortable and know exactly what to expect. Because we use state-of-the-art operating rooms with the capability to perform intra-op endoscopy, we are able to examine the stomach laparoscopically using a tiny camera. This allows Dr. Lutfi to resolve any scar tissue left from the prior surgery, which will help you get back on the right track and be able to stick to portion control without hunger pains or food absorption problems. To lift the stomach slightly away from the small intestine, the abdomen is temporarily filled with carbon dioxide gas. Dr. Lutfi then uses the laparoscope to remove a portion of the upper curved area of the stomach called the fundus. This makes the stomach smaller and into a more tubular shape. The fundus produces the hormone Ghrelin, which causes hunger. Removal of this portion of the stomach doesn’t mean you will never feel hungry, but hunger pangs are significantly reduced, while the stomach is also made smaller to accommodate less food intake and help you feel full faster. Visit our Preparing for Bariatric Surgery and Day of Surgery pages for instructions on how to get ready for your procedure. How Much Weight Can I Lose After Revision Bariatric Surgery? At our Institute, we give you comprehensive support to lose as much weight as possible and to maintain your health and weight after your surgery. We work with you extensively during your follow-up, and our nurses and dietitians are available to you every day. We even have our own support group run by our staff. We are committed to your success! Who Is a Good Candidate for Revision Bariatric Surgery? If you are dissatisfied with the results of your first bariatric surgery or are experiencing subsequent weight gain post-surgery, you are probably a good candidate for revision surgery. You must be willing to follow the dietary protocol after the surgery, however. If you are not, even a revision surgery will not be successful. It’s important to remember that your weight loss journey only begins with surgery. The journey continues after that for the rest of your life. Dr. Lutfi will examine you carefully and evaluate your history before making a recommendation as to whether revision surgery is a good idea for you. He will also recommend which technique he believes would work best for your revision procedure. It could be that a different technique than your original surgery will give you a better chance of success. After you’ve had a thorough conversation with Dr. Lutfi and his team and undergone some thorough testing that often includes an endoscopy, the final decision is always yours. For more information, please visit our Am I a Candidate? page. What Is the Recovery Like from Revision Bariatric Surgery? The recovery time from all of our bariatric surgery procedures is faster than you might think. The surgery requires just one night in the hospital in most cases, and you can go home the next day. Most patients can even exercise the very next day! Of course, surgery generally results in some bruising and soreness. All of these symptoms are usually minimal and gradually subside within a few days due to the tiny incisions (minimally invasive approach) used to perform the operation. Dr. Lutfi will prescribe pain medication for you so that you can recover with minimal discomfort. Since your body won’t absorb all the foods you eat, Dr. Lutfi will prescribe nutritional supplements to make sure you maintain good health after your surgery. You will need to take these for the rest of your life. They will include vitamins, iron, calcium, and more. Our dietitian will make sure you understand everything about the supplements, will give you all the information you need, and will then follow up with you to make sure your nutritional status is optimized. Visit our Recovery & Follow Up and Life After Surgery pages for more information. What Are Some of the Complications from Revision Bariatric Surgery? Revision Bariatric Surgery has a higher risk of complications than initial bariatric surgery. The most fearful risk is leakage of stomach contents from the site of the sutures connecting the stomach to the intestine (known as anastomosis). If this occurs, it could result in a severe infection and may require another surgery. A common side effect of this surgery is called “dumping syndrome.” Patients who experience this effect experience stomach pain, nausea, and/or vomiting after eating high calorie or high sugar foods that should be avoided. There is an advantage to this, however, because it causes patients to avoid these foods which deter post-surgery weight loss. Nevertheless, the advanced techniques we use today make even revision surgery very safe. While complications are rare, the most common include constipation, gallstones, and infections. Dr. Lutfi will monitor you carefully in post-operative examinations to make sure that you recover properly. Please visit our Bariatric Surgery Risks & Side Effects page for more information. Contact us today to find out more about Revision Bariatric Surgery or our Obesity & Bariatric Program.